Christophe has made the source of the Mobile Trader application freely available on github, so go download it and creating your own collaborative applications! I know, you *really* want to see Stage3D out in the public… I promise you, it is coming, and it will be enable you to build great apps & games. I almost forgot to mention: I wrote less than 200 lines of code to create project awesome! It uses the Away3D library, and LCCS… the hard stuff is easy with Flex. On the official Adobe Flex Team blog, there is a great post by Andrew Shorten discussing the future direction of Flex. I highly recommend taking a moment to read it. In that post Andrew points out where Flex is, and where Flex is heading. One thing I want to re-emphasize is that mobile is the next big thing. It has been proclaimed many times, in many publications that mobile devices (tablets and smartphones) are the future of computing. This is both in enterprise and consumer products & applications. One of the catches with this growth is that each platform has it’s own development tooling and language. Wouldn’t it be nice if you could just use one programming model & technology stack? Even better, wouldn’t it be nice if you could use that same programming model & technology stack to also develop applications for the web and the desktop? Wow, what if you could even share code libraries across mobile, web, and desktop applications? That would be awesome. Wait… you can already do that! Adobe Flex is the best tool for creating cross-platform, rich experiences in mobile, desktop, and web applications. The best part is that you don’t need to learn any new programming skills to develop and deploy for these platforms. You will need to learn about the app ecosystems, platform signing and deployment procedures, and device specifics (soft keyboards, hardware buttons, etc..). However, you can still develop these applications quickly and easily using Flex, ActionScript, and AIR APIs. 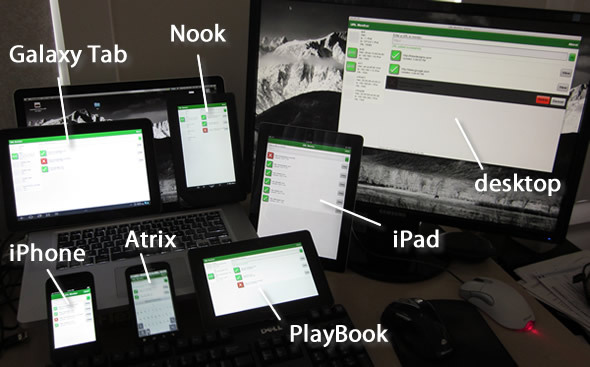 One code base; multiple platforms; lots of devices. Did you know that you could even take that same code and deploy it to a TV? Even better, there are great new advancements in the Flex/AIR mobile tooling waiting just over the horizon. We’re continuing to focus on runtime performance, native extensions, new components, declarative skinning, adding more platforms and improving tooling workflows, such that in our next major release timeframe we expect that the need to build a fully-native application will be reserved for a small number of use cases. The growth of the mobile market and the challenge of building out applications that work on a range of different form-factors and platforms present us with a huge opportunity to expose Flex to an entirely new audience of developers, while continuing to be relevant for existing Flex developers who are extending their applications to mobile. Flex & AIR for mobile allow you to use the same enterprise class tooling to build cross platform mobile applications. You can still use existing framework components, existing open source libraries, the strongly typed programming language, automated ASUnit testing, build scripts, and many other features that Flex offers, and you can now target mobile devices. It is an exciting time to be in the tech space, especially around all things mobile. Don’t get left behind. Go grab a copy of Flash Builder and start building mobile apps today. You can literally build your first mobile app in 5 minutes. Stage3D is starting to look incredibly promising for developers. Whether you are targeting mobile, web, or desktop or developing for gaming or data visualization, the future is bright. I was in the Adobe offices in San Francisco last week meeting with the team, and Thibault Imbert showed us some jaw dropping demos… Keep an eye out for whenever those become public. …but it is not all about games. In a recent post, I showed off some basic stage3d hardware accelerated graphics within AIR on mobile devices. I’ve been developing some ideas to show how this can be applied within non-gaming contexts, and I figured I’d show my progress so far. The previous post was an actionscipt-only project. In enterprise scenarios, you most likely will want to take advantage of the plethora of pre-built components that the Flex framework provides. The progression for me was natural; How about showing what Stage3D can do within a Flex for mobile application? Above is a fairly basic visualization application. There is a stage3D-based custom charting component, tied into data that is displayed using a standard spark List with a custom item renderer. The chart is based on my previous example, and obviously isn’t fully fleshed out (no legend, no ticks, no axis labels, etc…). Did I mention, this is on a tablet? Oh yeah, that is pretty awesome. Did I also mention that it will be cross platform once released? Oh yeah, that is pretty awesome too. The data is morbid, but it works for my scenario. It is based on this data set from CMU.edu, which shows the cancer deaths and the number of cigarrettes consumed per state. Please keep in mind, this is all beta, and not a final build. I’ll post the source code once Stage3D for mobile is publicly available.